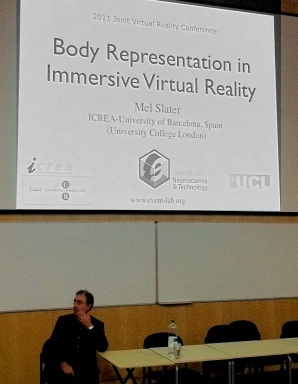 This is a summary of Mel Slater‘s keynote at JVRC 2011, entitled “Body representation in Immersive Virtual Reality”. M. Slater started his talk by stating that the goal of VR is that people act as if what they’re experiencing is real, even though they know it’s not. Your mind accepts the illusion. He insisted that this is not your imagination, it is really a perceptual illusion. Normally, when you enter a virtual world, you enter it with the same personality, the same “you” (whatever that means). But studies have shown that if you have a different representation of your self, you behave differently ! In a recent study M. Bailenson showed that improving the “attractiveness” of your avatar will transfer as self-confidence in the real world. This is called the Proteus effect : appearance can transform our behaviors towards other people. What M. Slater is most interested in is how your appearance affects your own perception, your self-image. This is of great importance for understanding how your brain actually represents your body. M. Slater translated this experiment in VR, replacing the rubber hand with a virtual hand and showed that it works the same as the original experiment. One objection against that is that the user might believe that you’re actually going to hurt his real hand, so you have no way of actually knowing if the body has really been transferred or if it’s just the fear of a real injury. They’re actually working on experiments to test this which doesn’t involve real life threat. In the meantime this can be used as a good indication and indeed not a proof of transfer. The question is then can you transfer your whole body and not just your hand ? Also how much latency or error can be tolerated ? How close to your body does the avatar has to be ? How close to a human does it have to be ? He showed two examples, the first putting you in a fat avatar, and the second where your arm is stretched and you accept it roughly until it’s three times as big as usual. M. Slater noted that fear is probaby easier to trigger in VR, but that inducing happiness would be quite interesting. That’s one reason a new project called VR-Hyperspace was just created: to try to make you think your body is in a more comfortable position than it is in reality, which could have applications for plane or train travellers. Those are really exciting possibilities. I am mostly interested to see what could be done to create empathy; experience another person’s view of a story, his life, for example as a handicapped person. 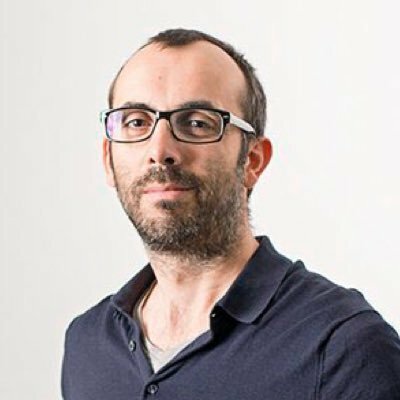 Teaching social interactions could be really beneficial: a recent experiment by Benjamin Lok’s team taught new doctors to speak with a patient, and then enabled the doctor to re-live the talk from the patient’s point of view. This is really helpful to understand the impact of every word you say and how the patient receives and lives them. But we also have to watch out for the ethical implications of those possibilities, because it could cause even more damage than TV ! Really interesting stuff, thanks for the summary!